欽定訳聖書申命記10章9節‐Wherefore Levi hath no part nor inheritance with his brethren; the LORD is his inheritance, according as the LORD thy God promised him. 欽定訳聖書ヨハネによる福音書1章1節‐In the beginning was the Word, and the Word was with God, and the Word was God. 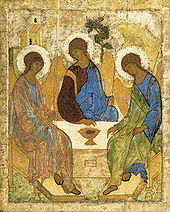 ^ バプテストからの出典：Of God and of the Holy Trinity. ^ a b P.R.ハーツ『道教』<世界の宗教> 鈴木博訳 青土社 1994年、ISBN 4791753003 pp.12-23.